We are pleased to announce that Overloud have made their critically-acclaimed Vintage Keyboard FX available in the ProChannel format. 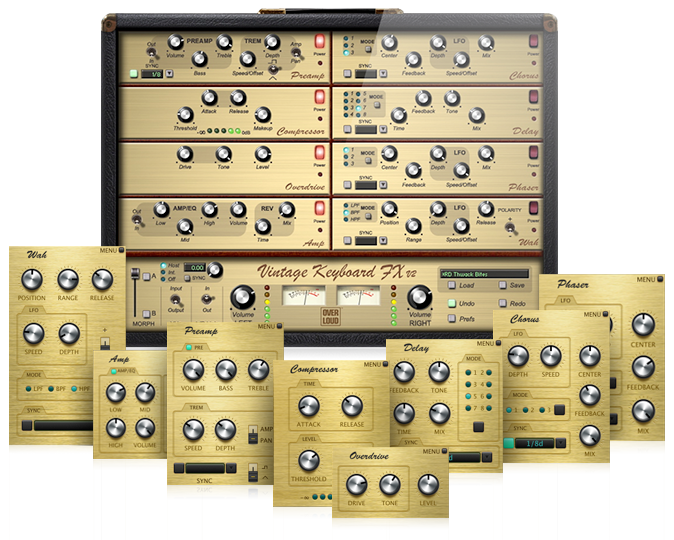 Overloud VKFX is a virtual rack packed with outstanding models of vintage analog effect processors, especially suited for keyboard players. It captures the sound of the original masters, which were often the key element in defining a classic instrument's unique 'voice'. Overloud VKFX is a must for any keyboard player and for anyone who wants to add a vintage color to their recordings! If you cannot get that kind of warmth from your sample library or your synthesizer, or even on a recorded track, Overloud VKFX enriches all your tones and allows you to recreate the sounds of countless records. What's in the Overloud VKFX bundle: The Overloud VKFX bundle includes all 8 effects processors as ProChannel modules as well as the full suite version (VST/AU/AAX/RTAS). Buy them individually: You can also purchase any of the 8 effects processors individually as VST and ProChannel modules on the Cakewalk Store. Highly CPU efficient coding and module layout means that users can load many instances of Overloud VKFX without the fear of watching a system's processor overload appear, in the certain knowledge that processing quality is first class. Module order can be rearranged by simply dragging and dropping modules to where they're needed, giving users' fast and total control over the effects. All rates and times can be sync'd to the DAW, internally timed, or left independent for a more 'analog' approach. All parameters are automatable. All parameters can be assigned to MIDI controllers. Now available as both a VST and ProChannel module (ProChannel requires SONAR X1 Producer Expanded, SONAR X2 and X3 Producer, and SONAR X3 Studio).